Hey all. In my first blog post, I want to concentrate on 'faction release' ideas, so I'll be talking about lore as it pertains to new models and story direction for the faction.  Ruminating on how to fix the mess that is the state of the Duardin disunion, I came up with an idea for two releases to bring them into line. Based on Skaven and FEC, it seems future AoS releases will comprise of at least a book, terrain and endless spells. Below are my ideas for revitalizing the factions with as little new things as possible (trying to keep my hopes grounded). It’s primarily a lore-focused post though coming up with new models means discussing mechanics too, but I won’t get into the nitty-gritty of allegiance abilities. I'll be discussing two separate releases: KO and a combined Dispossessed/Fyreslayers one. I'll start with KO, not because I think it'll happen sooner (Fyreslaters/Dispossessed are more due), but because it's the shorter pitch. Of the three Duardin subfactions, the Kharadron seem to be the most popular and are also the most aesthetically distinct and most separated from the others in the lore (literally ascending the holds and no longer venerating the ancestor gods). 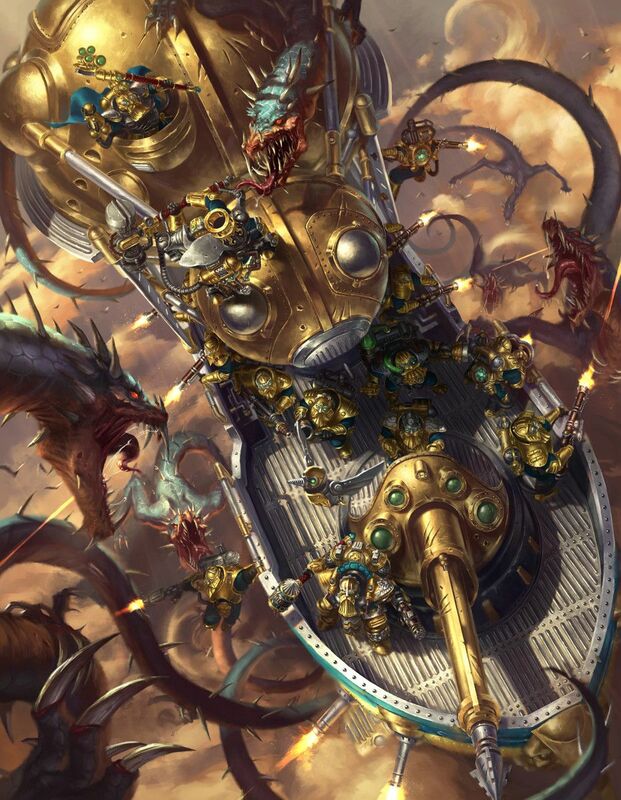 An updated Kharadron Battletome should keep them separate; fix the imbalances of the skyports and their underpowered Thunderers and Gunhaulers. To go along with this release, it would be great to see more aerial vehicles (perhaps a specialized mining tugboat? ), but they don’t necessarily NEED new units. First, there’s the obvious ‘floating vein of ethergold’ terrain piece, which would obviously function as a buff piece, perhaps also as cover for nearby skyships and one other function that we’ll get to shortly. The only issue is that, if I remember correctly, ethergold is often invisible and hidden in the clouds, so a bit of creative license is in order. The other less likely but (IMO) more exciting option is to use the slot normally reserved for endless spells as a ‘sky bestiary’. There are many evocative passages describing beasts that are drawn toward ethergold, so the presence of an ethergold terrain piece could presumably lure them to the battlefield. The fact that they’re feral beasts from the open sky means they could have similar mechanics to endless spells. They’d be point-costed units (though not counting to your behemoth limit) which ‘descend’ (similar to Stormcast 'zapping' down) within range of the ethergold terrain. The controlling player then gets to move them, and from that moment their movement follows the rules of predatory endless spells. They have a normal 'wounds and attack profile' (they have to killed, not unbound). They only move normally and can’t charge, but if they’re within 3 inches of a unit in the combat phase the players roll off and the winner must pile in with the beast and attack a unit of their choice (they can’t choose not to attack, so if the only thing in range is theirs, tough). I think all of that would make for a fun variation on the risky predatory spells mechanic, and with clever positioning by the KO player it could really pay off. A baby Megalofin. Much smaller than an adult leviathan, this shark-whale would still be on a 120mm oval and is of comparable bulk to a Frigate. This would be your 100pt monster. A Sky Serpent, as depicted in the above picture. On a 90mm oval, this is a fast, brittle, budget alternative to the Megalofin. The cheapest beastie. Three Lovecraftian jellyfish (inspired by the look of the Harkraken). They float together on 32mm rounds, and, while lacking raw CC power, could spew poisonous debuffs which paralyse their victims. The fact that all of these creatures lack riders or intricate adornment means that the lower quality plastic of endless spells could nonetheless do the model justice. The mass of these creatures means it would probably £5 – 10 more expensive than a normal Endless Spell box, but that’s a small sacrifice to get some truly impressive creatures (which I’m sure would be popular with non-Kharadon hobbyists too). I think there’s a case to be made for combining Fyreslayers and the Dispossessed as, unlike the KO, they share an allegiance to the ancestor gods. 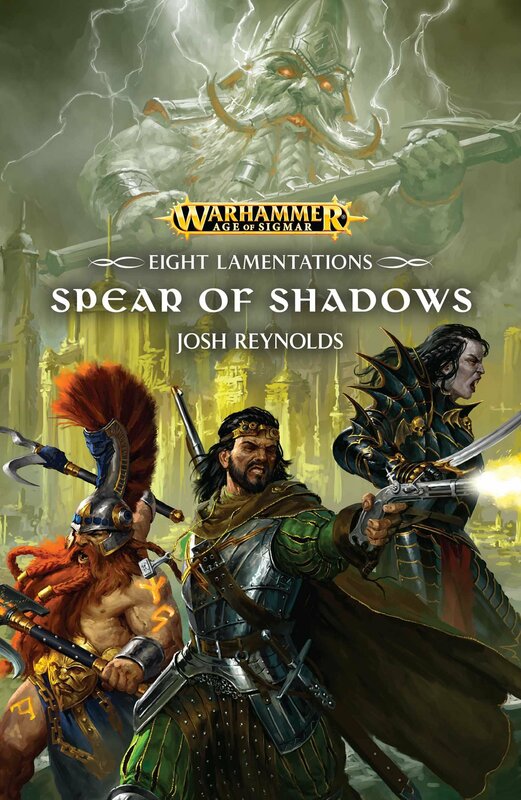 Please don’t put me in *the book* for this comparison, but I see parallels with how the Gloomspite Gitz tied in three distinct factions (Moonclan, Spiderfang and Troggoths) under the Bad Moon, but worship it in distinct permutations. 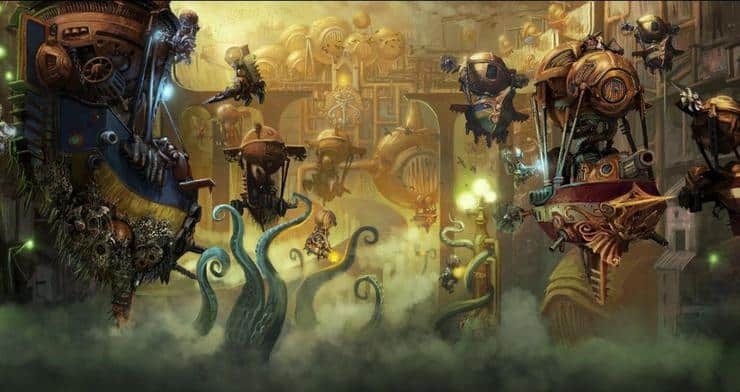 Likewise, a proper Duardin release could incorporate the three ancestor gods: the Fyreslayers follow their shattered god Grimnir, the Dispossessed could be tied into Grungi’s domain by consolidating their Ironweld Arsenal contraptions and, to round it out, I advocate the return of presumed dead goddess Valaya as a third mini-faction. Grungi, The Smith (as seen on this novel cover). This is the flagship model, a literal god of craft. He’s made frequent appearances in the fiction, and he clearly feels conflicted about retreating from Duardin life to work with Sigmar so his return creates an interesting ‘redemption’ dyamic. Perhaps the sons of Grimnir are less forgiving of his absence. He has established size-changing powers, and so he could be a troll-sized figure atop a mobile foundry throwing mystical augmentations to his allies like it ain’t no thang. Runic Golems. The long-rumoured mechanical automatons would certainly fit with Grungi’s return. I’m thinking hard-as-nails machines the size of Kurnoth Hunters, fulfilling an elite bruiser role which the otherwise Duardin lack. This could very easily fit with the steam-punkaestheticc of the Gyrocopters or the Cogsmith. Finally, we have The Cult of Valaya. Valaya was implied to have been devoured by Nagash during the End Times, but if you can’t think of a story excuse for her essence to escape Shyish and return to her people then you aren’t trying :P. Valaya is the god of healing and home, and she would be embraced by despondent Duardin searching to reclaim their ancestral sense of home and safety. Valaya’s devotees would wear religious garments instead of the Gromril of Grungni’s folk or the, erm, loincloths of Fyreslayers. Also, it’s an underrated fact that she was the god of alcohol, a rare angle for a female-coded god and something worth exploring. The slightest of the three factions, these are your ‘gap-fillers’: focused on buffs, healing abilities and providing attacks with rend. Oh, and we finally get female Duardin (not exclusively, but we follow the trend of mixed-gender units set by Deepkin or new Stormcast). Priestess of Valaya. She’s a powerful practitioner of Valaya’s prayers, the closest thing to magic Duardin get alongside Fyreslayer runes. Battle Surgeon. A more hands-on healer, this model is close-combat/support hybrid. Shrine of Valaya. This mobile platform pulls double duty: part holy clinic, part repository for fine alcohol. This could be a Magmadroth-like kit, where you get options for heroes that you can also assemble as infantry. Otherwise, you could make it a Cauldron of Blood style multi-kit, providing Grungni/Grimnir themed builds. Hearth Pilgrims. A mixed gender unit of pious monks, these are your alternative battleline slot. Faster than Grungni’s armoured folk, they provide valuable rend in their blessed maces, as well as the obligatory healing abilities. Though we don’t need ANOTHER infantry unit, there’s the option to have the pilgrims a dual kit for Ancestral Masons. These function in society as construction workers, but on the battlefield have a more direct combat role and perhaps the situational utility of being able to ‘demolish’ board terrain. Like the Gitz, I think the key is to imbue the three subfactions with a distinct identity (in aesthetics, theme and playstyle) while giving them a reason to be fielded together. Currently, the Fyreslayers excel at CC punch, and a new book would do well to give them movement abilities so that they are the 'fastest' of the Duardin armies. Grungni's Folk (the Dispossessed) should be the shooting mainstays, with high armour values to go along with it. The Cult of Shallaya, meanwhile, should dominate the field in terms of buffing auras and healing, exhibiting an 'anti-death army' playstyle which befits a god who has spent millennia enslaved by Nagash. Lastly, you have the same problem as the KO: they don’t mess with magic. Perhaps, then, the best way of making use of that development team is by releasing not one but three terrain pieces, thus reinforcing the tripartite theming of the factions: a ruined cache of Ur-Gold for Fyreslayers, an ancient forge for Grungi’s Folk and a Duardin tomb for the Cult of Valaya (each bestowing their faction with particular buffs). It’s also an opportunity to emphasise slight tension between the Grimnir and Grungni: perhaps you cannot give Fyreslayer characters artefacts if you’ve deployed an Ancestral Forge. If you’ve read all that I’m flattered. Anyway, that’s how I’d approach ‘fixing’ the Duardin in AoS. I believe that, providing the quality of the release is good, Duardin fans would generally prefer a fix sooner than later and I think this wishlist/prediction is realistic in terms of scope and not an unreasonable direction for GW to take in terms of lore. Agree? Disagree? I'm in agreement with you that the whole magmadrake theme should be continued with Fyreslayers, maybe with some smaller beasts. Agreed, that's the direction it seems the lore is going. I do however want the return of Valaya (it would make for compelling lore), and her deal would fit nicely with the non-engineering side of the dispossessed. As for your KO suggestion for endless spell surrogates, now that Khorne seems to be getting 'endless prayers' I think your guess is more likely than mine, but I still hope GW goes for the more unique and interesting Sky Bestiary choice. Oh wow.. I am actually LOVING your suggestions and they do make perfect sense as I read through them. [looks at his own unimpressive face stubble] "Haha, yes, erm, totally!" Well cheers for reading, dude. I also hope that this wishlist turns out to be clairvoyant, though the downside of that would be I'd end up buying more stuff for my shame pile!